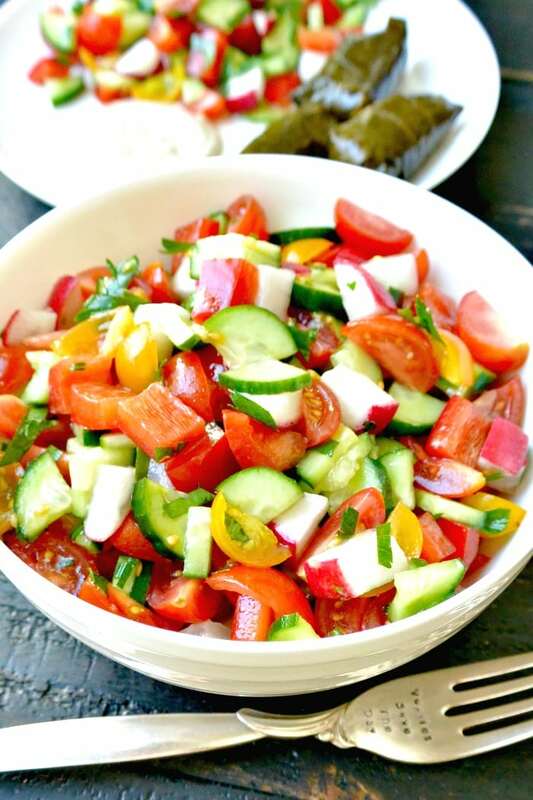 Mediterranean Cucumber Salad is healthy and easy to make. And this refreshing salad is naturally vegan and gluten free. It can be eaten on its own as a light meal or as a side with other summer dishes. This recipe was originally published on 9/13/2015. We have all heard how healthy the Mediterranean diet is. One of the reasons is because people of the region tend to eat a lot of colorful, minimally processed, seasonal vegetables. 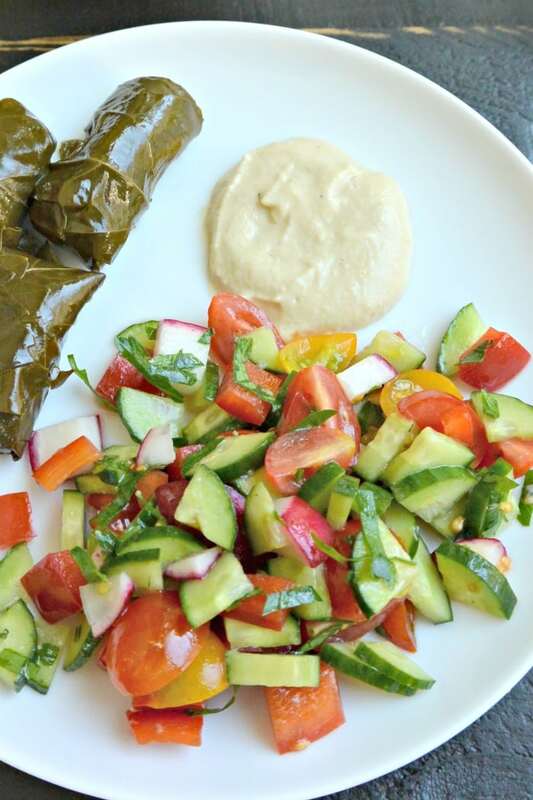 Like this Mediterranean Cucumber Salad, which is flavorful and delicious. It’s a perfect dish to make on a regular basis during the summer. In fact, you can make a big batch to enjoy all week. It makes a wonderful side dish for anything from veggie burgers to pasta. And it’s great as a light lunch, maybe with some crusty bread or hummus and stuffed grape leaves. You can even boost it by adding some beans such as chickpeas (garbanzo beans), kidney beans, or white beans. 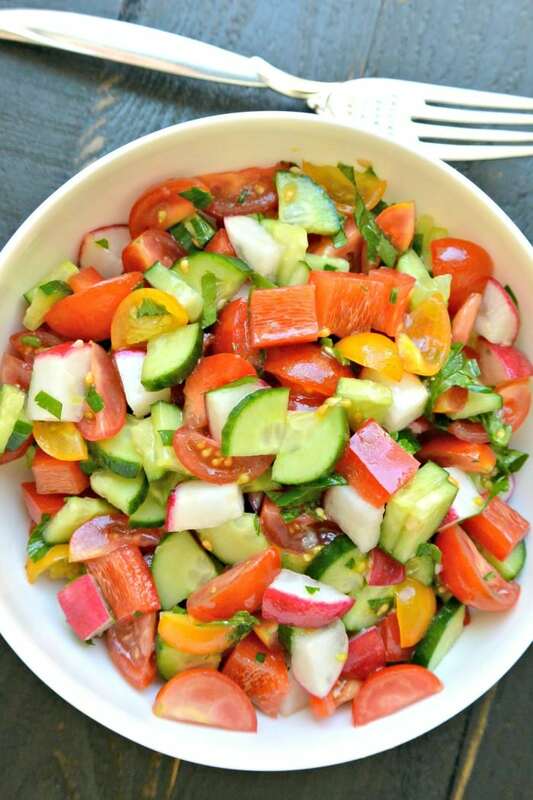 This cucumber and tomato salad falls into this way of eating since it contains plenty of produce, olive oil, fresh herbs, and only a little optional salt. Mediterranean Cucumber Salad is simple to make. It’s especially perfect when you have an abundance of cucumbers and cherry tomatoes from your garden, CSA box, or the farmers market. The only special equipment I use for this recipe is the herb scissors I also use in my Easy Fattoush Salad Recipe with Chickpeas. These scissors make cutting herbs so easy, even when they’re wet. When it comes to the ingredients, you can use any kind of tomato you like, but my favorites are cherry and grape tomatoes. Here I used a combination of red and yellow cherries. For the cucumbers, I prefer Persian or English cucumbers since their skin is thin and I don’t mind the seeds. However, if you’re cucumber isn’t organic, you should peel it. As you can see in the short recipe video, all you have to do is combine all the ingredients in a salad bowl and toss everything together. Similar recipes include Israeli Salad and Persian Shirazi Salad. You may see these popular salads on restaurant menus. 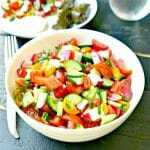 They resemble this chopped Mediterranean salad in that they all contain cucumbers and tomatoes. However you may see slight differences such as the inclusion of onions or perhaps different herbs. But whatever you call it, this salad is healthy and delicious. Try it with other Mediterranean-inspired recipes. 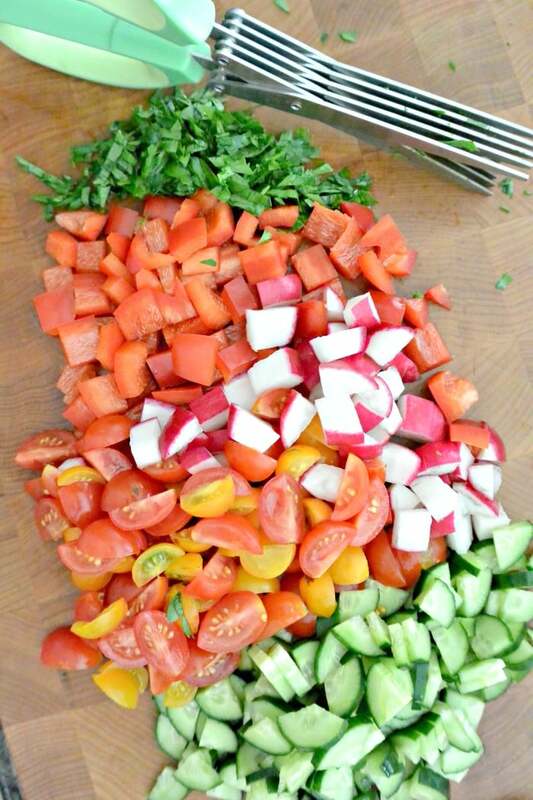 Now let’s make Mediterranean Cucumber Salad! Serve at room temperature, or refrigerate and enjoy chilled. Leftovers can be stored covered in the refrigerator for a few days.